When the smell of pancakes drifts through our home, it is usually the weekend. We love the homey and relaxing scent. Pancakes are a breakfast to savor and forget about the weekday rush. The theme for Playful Preschool this week is pancakes. Since the Sugar Snaps love too cook, I decided to have them make pancakes, with a twist. 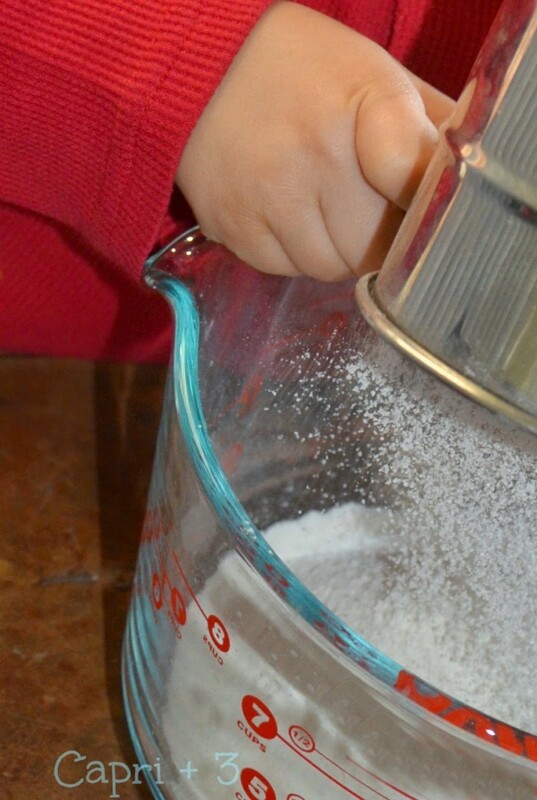 Tip: I recommend getting a sifter and having your preschooler use it in baking. It is great for fine motor skills and is worth the investment, both to have fluffier baked goods and to add to the fun for kids. Preheat the oven to 350 degrees. 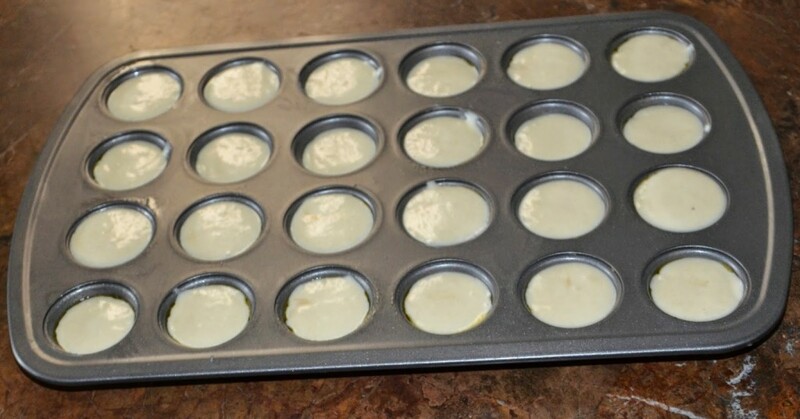 Spray your mini muffin tin with cooking spray. Make your batter. I recommend breaking it into small steps and having your preschooler practice measuring, pouring and mixing the ingredients. 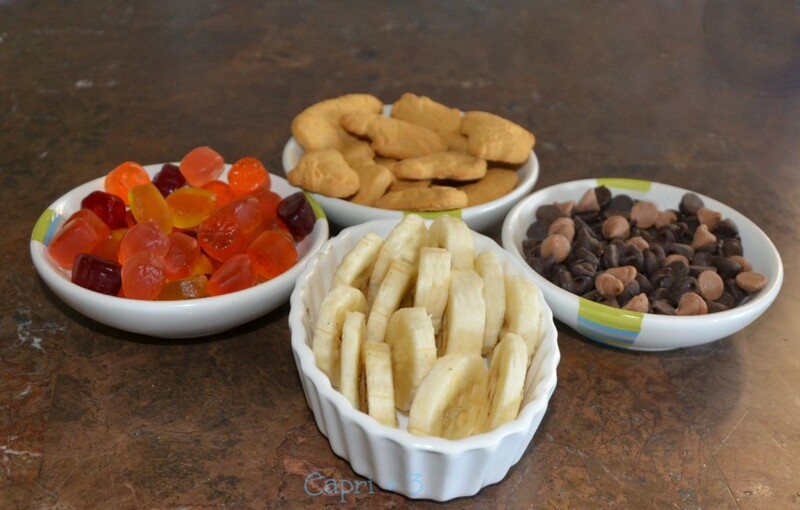 Set out four fillings in separate containers. 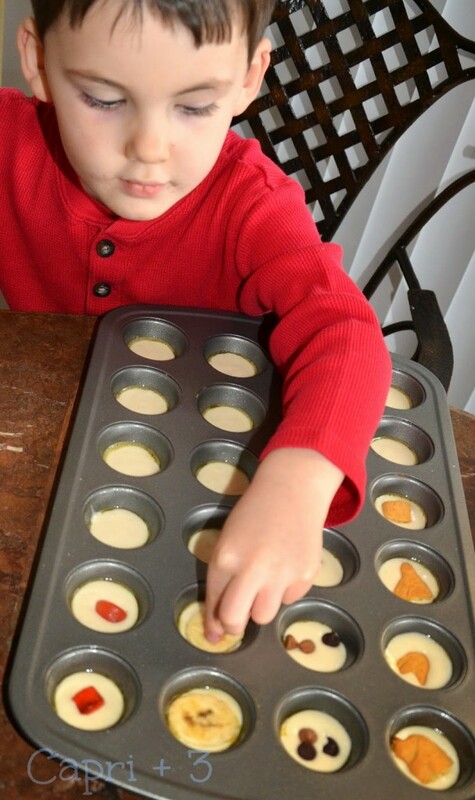 Add (or have your preschooler add) one teaspoon of batter to each of the 24 muffin cavities. Next, have your preschoolers add one row of each filling, one at a time. I had them count three chocolate/peanut butter chips when using that filling. Alternating fillings helps them with patterning and organization. Once all of the fillings have been added, add one teaspoon of batter on top of each filling to cover it up. Bake at 350 degrees for approximately 15 minutes, or until cooked through and golden brown on top. The fillings are hidden underneath the batter. 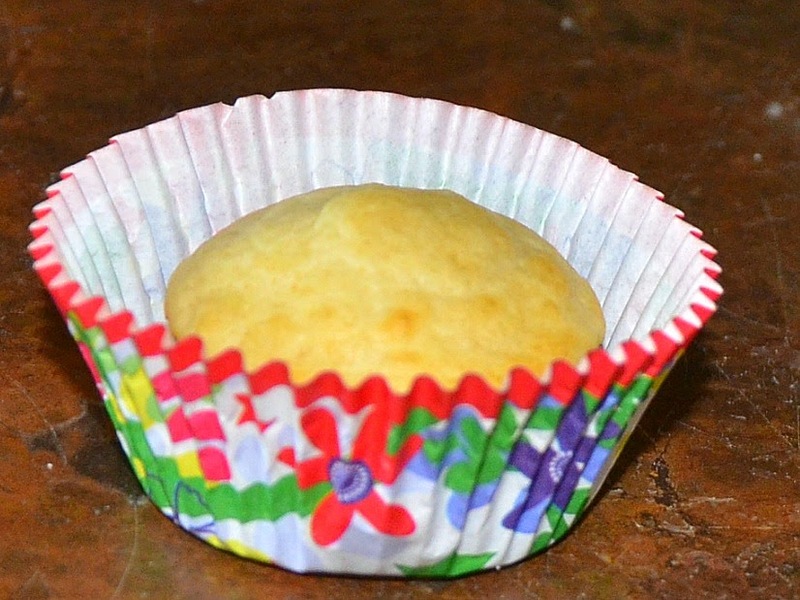 I placed the pancakes in these cute cupcake liners after they came out of the oven. Once the pancakes have cooled enough to handle, place four on the plate (one of each filling) and have your preschooler pick one to eat and be surprised by what filling is inside. They could also guess as to which filling is inside. The Sugar Snaps had a lot of fun picking out a pancake and discovering the hidden filling. The gummy fruit snacks fell out the bottom on a couple of muffins but were easy to pop back inside. It may be a good idea to add a little more batter to the bottom if you decide to use that as one of your filling options. Alternatively, you could cut pieces of fruit leather which are a little lighter weight. Have you made pancakes with your children? Do you have any fun twists on traditional pancakes. Please feel free to share in the comments or on the Capri + 3 Facebook page. I’d love to see your pancake photos there. 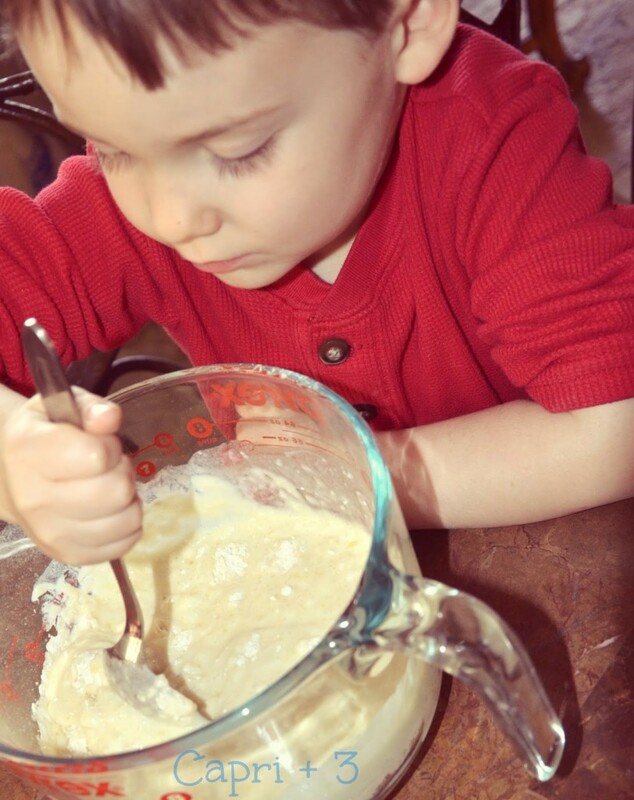 Check out the rest of the #playfulpreschool pancake themed educational ideas. 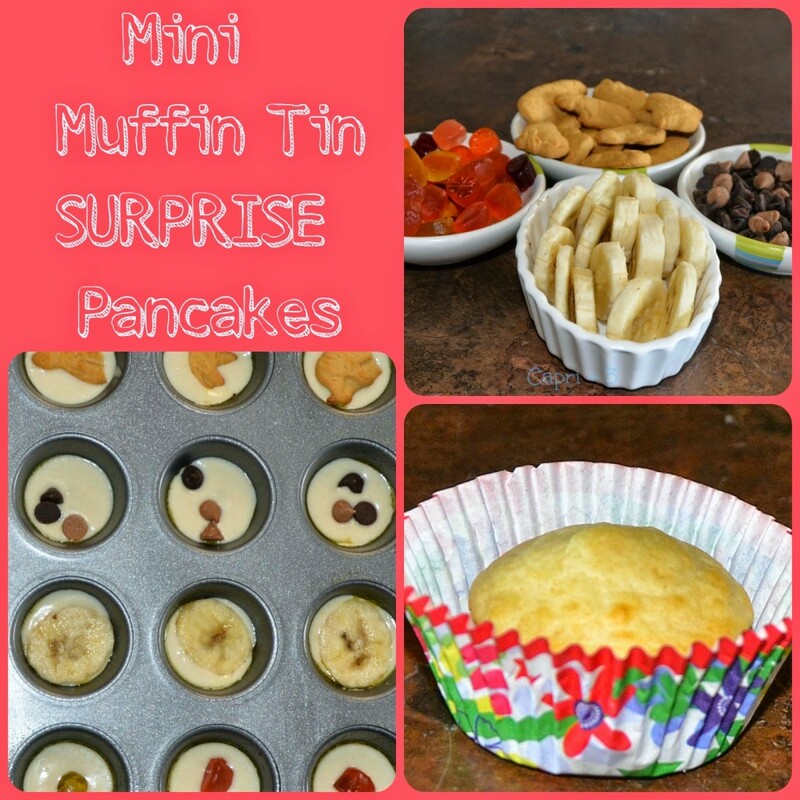 We've made muffin tin pancakes before, but just used fruit. Yours are so much more fun! Great idea! These would be fun for a play date. It would be fun for friends to guess the filling after they came out of the oven and were out of the tin. They had a lot of fun. They could not wait to surprise Daddy when he got home. Thank you. They had a lot of fun with the fillings. Thank you for pinning. I think our kids are pancake-aholics too! 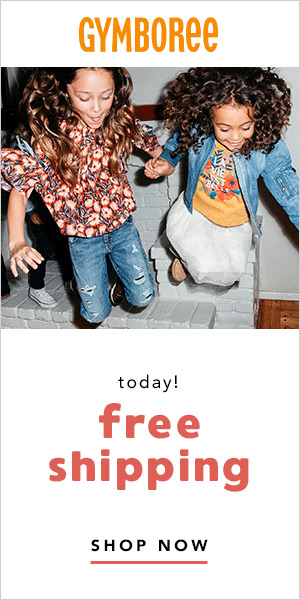 I hope your daughter has fun trying these out. What an adorable idea! We love pancakes too…on the weekends. I'll definitely try these out with some blueberries and maybe MandM's. What a great idea! I'm sure my son would love these. It's a great way to sneak in some veggies too! Those sound like yummy fillings! We will have to try those out next. Yes, veggies would be another fun option! Our kids love veggies and would find it fun to try veggie fillings. We will have to try that. I love this – pancakes for breakfast in the UK is fairly recent they are a pudding here. But looking at your pancakes in the muffin tin I think you've made yorkshire puddings but with a sweet filling – kind of like a toad in the hole (which is made with sausage) but for treats… I love it and going to try it with the kids as they love Yorkshire puddings. Looks like fun! My daughter would love to do this!! I hope your daughter gets a chance to try it out and surprise people with the fillings. Cute idea. Love that your kids were able to help. This is such a great idea!!! My daughter would be all about these! I may have to make some this weekend! What a super fun idea! My boys would love eating these for breakfast! I am going to make some soon! Thanks for sharing! OMG how much fun are these?!!! I HAVE to make these tomorrow morning for breakfast! We like to add frozen wild blueberries. I hope your kids enjoy it some day. Your blog name is perfect for this! You might have to use apples as one of your fillings. I hope you enjoy making them. Frozen wild blueberries would be a fantastic filling! There are so many possibilities. Love this idea! I think we'll try it this weekend. YUM. Thank you. They had a lot of fun making the pancakes. I think it also made them more invested in the surprise element when they ate them. I hope you enjoy trying this out. There are so many possibilities for fillings. I hope your daughter has fun helping you makes some. I love that you can use whatever fillings you already have at home. This is a fabulous activity! I'm pinning and sharing. Thanks for this idea! I love this. My boys love discovering hidden things in their food. Putting this on the menu for next week! I hope your boys have fun with this.